WSPR KITS ARE NOW SOLD OUT! Welcome to the Stellar WSPR project! We have collected here relevant material about WSPR including links to interesting WSPR articles, videos and projects. In addition, Stellar WSPR offers unique products, parts, and kits for the inquisitive mind. Our unusual offerings are not found anywhere else on the planet. For your convenience Stellar WSPR maintains most of the items in stock. We are based in the USA and can offer fast shipping here and world-wide. Click above to see our product line. If you are a science teacher this WSPR project is for you. We will try to help you and your students stay interested in science. There are also possible applications to the STEM program. We have WSPR lesson plans, complete ready-to-go receivers and kits. We accept school purchase orders and offer an educational discount for quantity orders. WSPR is not just for educators; SWLs, experimenters, ham radio operators and others will find this technology fascinating. Our unique parts selection allows students and experimenters to build their own projects with minimum fuss. 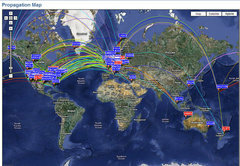 WSPR (pronounced “whisper”) uses software and low power signals to communicate globally. WSPR is a “weak signal propagation reporter” and is used for finding communication paths. It can astound you with its ability to communicate worldwide using very low power and signals at or near the noise level. Power levels of 500 mW and often much less are used. It is more exciting than short wave as the messages contain data. A nice feature of WSPR is that “spots” can be automatically downloaded to a central database WSPRnet.org and results shown on a large map. See facing page. This is a great motivator for kids. We hope you explore this web site to learn more about WSPR and its features. 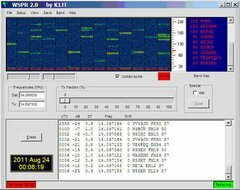 Software designed by Joe Taylor (K1JT) is at the heart of WSPR. If you are just starting out we suggest that you visit his web site to read the on-line user's guide. A screen-shot of main screen is shown above.